Sure, the piece of cake, right? 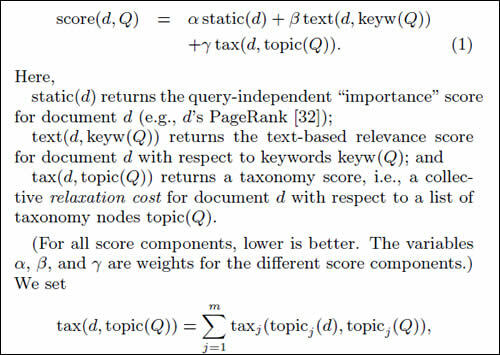 In case you ever wondered what a search engine algorithm was like, just take a look at some of the proposed information retrieval models that could very well “be the engine” behind your next search. Just as my fellow optimizers are trying to stay afloat, brilliant advances in search engineering ranging from query expansion, static scoring, query expression, taxonomy edge weights and more are making their debut to throw yet another curve ball at those who would try to breach the barrier to entry of the top 10 results. Aside from competition (which can be equally as fierce), search engine optimization requires that you observe shifts in algorithms so you can make adjustments or fine tuning on the fly. Some might say “write good content, build links and be patient”, but we prefer to look under the hood to understand the science behind SEO in addition to adhering to the basic principles of search. We know that relevance plays a part, but to really grasp search engines or search engine optimization, you should dig deeper to scratch below the surface to comprehend some of the fundamental processes involved in document retrieval models if you are ever going to appeal to those same algorithms. Here is a glimpse of a day in the life of SEO research and in this instance observing how hierarchical document taxonomies, location taxonomies, social media or metadata can re-rank documents based on who searches, where they are searching from, which medium is prominent (such as inverted indexes or what degree of relaxation/ variance is present). A fascinating read courtesy of Sergei Vassilvitskii of Yahoo research. “Typical examples are local search, in which the user is interested only in geographically proximate results , multifaceted product search, in which product meta data is effective to restrict search along many dimensions , and social search, in which an endorsement by another user may alter the ranking of an object based on the relationship between the user and the endorser. Previous Article Should You Advertise On Your Blog? Next Article SEO Is Great, But What Happens Next?